Something that's fairly common after a divorce or separation is to have a makeover. It can be a new look, a new wardrobe, maybe even a new car. It's a way of expressing freedom, and of closing a door on the past. It can certainly be therapeutic, not to mention expensive. But in the long run, does it really help? During your relationship you might have felt frumpish and unappreciated, and when you attempted something new your partner might not have noticed or even actively rebuffed it. Going out and making yourself over, creating the new person you've imagined yourself to be, can feel like a true liberation from the shackles of the relationship. 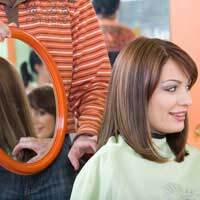 New clothes and a makeover - a new hairstyle, for instance - can be a shortcut to feeling glamorous, which could be exactly what you need, especially if it's something you've never experienced before. There's the old cliché of men buying a sports car for a midlife crisis, and it's become one because there's more than a grain of truth in it. Men can see their cars as an extension of themselves, so a better car gives a better image (and self-image). It's the male equivalent of a makeover and a new wardrobe - or it can come in addition to that. But feeling good in that way is often an ideal prescription after a breakup. You want to be able to look in the mirror and be happy with what you see. If it succeeds in that, then it's worthwhile. The largest immediate disadvantage to it all is the amount of money you spend, at a time when finances can be quite rocky. If you really can't afford it, don't do it. The good feeling will only quickly be outweighed by the bills and you'll end up stressed - which is not what you need at all. Having created a new image, the question is, do you really want to live up to it? For some it will be like stepping into the person they really are, but for others, it can quickly become wearing and unsatisfying. The person they envisaged just isn't them and actually can become uncomfortable. That's fine. You don't have to stay that way - simply revert to who you are. Look at the experience positively. You experimented, you tried it and discovered it wasn't you. As a result you know more about yourself than you did before - consider it one stop on a voyage of discovery. Whether the new image remains or not, it's a good transition out of the relationship and into a new life. It builds confidence, even if that's just in the short term, and that's an important step, since so many suffer from a lack of it in the wake of separation and divorce. The confidence can remain, and, in fact, it's a vital ingredient in the real new you that emerges. That person will come out, a little older and wiser, but more sure of yourself, stronger, and able to deal with the world, with being single again, and much more ready when you do find another relationship.